Tech giant Apple put the cat among the pigeons yesterday with a revenue warning that roiled share and currency markets. Its statement that slowing Chinese demand would hit revenue led to a mixed day for shares and triggered a "flash crash" in currency markets when orders came in to sell the Australian dollar and Turkish lira against the Japanese yen. This pushed the yen markedly higher against the US dollar even though the greenback appreciated against other Asian currencies. Investors also rushed to gold. 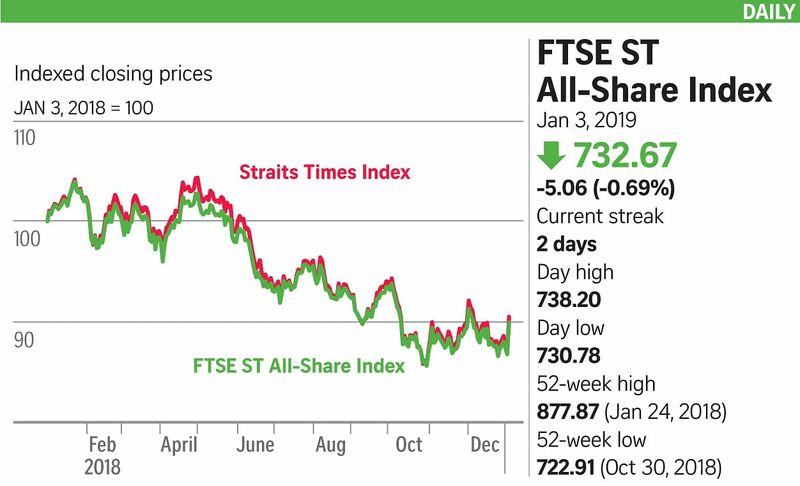 Local shares also had to contend with gun-shy investors eyeing slowing global growth, so it was no surprise when the Straits Times Index lost 26.01 points or 0.9 per cent to close at 3,012.88. Turnover came in at 1.16 billion shares worth $886 million, with losers beating gainers 218 to 154, while 24 of the 30 STI constituents ended the day in the red. ThaiBev was the most active, dropping 2.5 per cent to 59 cents on trade of 38.2 million. Other actives included Ezion Holdings and KLW Holdings. The biggest blue-chip gainer was Jardine Cycle & Carriage, which closed 1.5 per cent higher at $35.28. Apple's stark revenue warning weighed on the sentiment of technology and semiconductor counters around the globe, including here. Venture Corporation closed 1.8 per cent down at $13.51, while semiconductor player UMS Holdings extended its slide, shedding a further 2.6 per cent to 55.5 cents, its lowest in just under two years. Banks took a hit as well: DBS lost 1.7 per cent to $23.09, its lowest since late November, OCBC dipped 0.6 per cent to $11.03 and United Overseas Bank was 1.3 per cent down at $23.99. The same concerns weighed heavily on other Asian markets - Hong Kong, mainland China and South Korea all ended lower on the day. South Korea's benchmark Kospi index slumped to a two-month low, ending the day 0.81 per cent down. But the Australian market added 1.4 per cent as the cheaper Aussie dollar due to the "flash crash" gave more value to export-oriented listings like gold mining stocks. Malaysia's market also closed higher yesterday. Japanese markets remained closed for the new year and resume trading today. CMC Markets analyst Margaret Yang said investors are increasingly concerned about the slowdown in consumer spending in China. She said the impact of US President Donald Trump's trade war with China has started taking effect and will likely show up when US firms start reporting financial results.